Melissa, you recently had a child. How did this work out for you in terms of shooting around such a big event? Melissa George: Listen, it was a pregnant pause. (Laughter.) It was very short. Yes, it actually did. It worked out very well. You know, usually the schedule is you get a pilot, you get picked up, you’re shooting, you air, and the creative team have a very short window to really flesh out what they want to say. Here we had three months where the writers could actually produce and Jill Gordon could create the show that she wanted. I think that’s a gift. To me, there are no mistakes. And my son was 10 pounds, I want you to all know. So I’m sitting on a doughnut pillow right now, OK? Thank you. Dr. Kathy Magliato: But two pushes, he was out. Dave, were you already working on the show actively in terms of weekly production when your baby was born? Dave Annable: My baby was born Sept. 7, and I think I stopped around the 15th and was able to be home and be with my family for three months. And again, like Melissa was saying, everything happens for a reason. That’s some of the most important time that I could never ask for anything more. Three months being there to support my wife and having a newborn, and like Melissa said, giving the creative team time to see what we’ve done and take their time and write these wonderful scripts that we’ve now seen on the back end. Melissa George: And change the title. Dave Annable: Seven times. I think that’s not a luxury every television show gets. You have an infinite time to write a pilot, and then all of a sudden, you’re in production; you’re boom, boom, boom. Obviously, you see the quality sometimes sort of leak off, and I feel like these scripts that have come in since have been strong, and we’re very excited to get back to work. How did you come up with the idea for “Heartbeat”? Amy Brenneman: Well, it’s really all based on this woman right here, but as the producer that helped get it from Kathy and Kathy’s book to Jill Gordon, Brad Silberling, my husband, and I sat down with her. I was not looking to produce a TV show. I sat down with Kathy, and I remember driving away and thinking, “That woman is a TV show. Like, she’s a TV show.” It took a while to find Jill Gordon, who really brought it to life, because I think what Kathy. it’s all of her irreverence. It’s her surprising stories. It’s who she is. So I think it all started with Kathy, and then I got to midwife it to Jill. Dr. Kathy Magliato: Just to add to that, really the genesis of the story occurred based on that airplane story that you see in the pilot. That essentially was how this show got started. It’s a real story. It really happened. I was telling it at a dinner party at the home of Kelly and Ron Meyer, and Kelly I finished the story, and Kelly looks at me, and she says, “Oh, my God, you’re a show.” That’s really kind of how the show started was a fateful dinner party. Don Hany: So anyone stuck for a guest at a dinner party, you want to invite this woman. Dave Annable: What better resource to have in our writing room and on set, to have the real Dr. Kathy Magliato, aka badass, on our show, helping us and helping the writers create storylines and coming from a place of truth, which is always very exciting for us. Jill Gordon: I just want to point out one thing. There’s only a handful of women in the world who are cardiothoracic surgeons. The other thing I want to point is you have to look at Kathy’s freakishly large hands. Show them. Dr. Kathy Magliato: My freakishly large hands. Don Hany: But the book as well, right? The book influenced a great deal in terms of how the storylines all came up and stuff. A lot of the characters are based on characters from the book, and some of them are slight elaborations on the real thing. 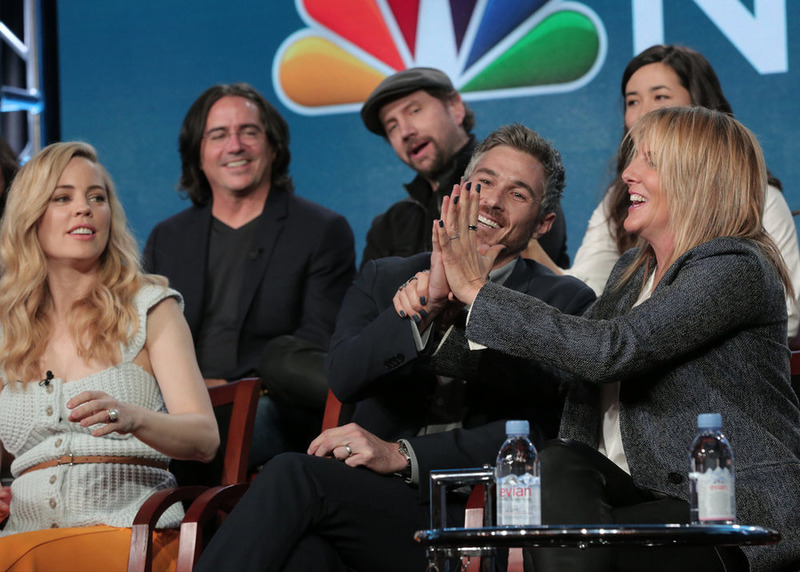 Melissa George: Kathy does not have as many lovers as I do on the show. Dr. Kathy Magliato: I’m working on it, though. Yeah, I will say that one of the things that I think is amazing about the show and what makes it so unique and so special as an offering is its authenticity. The fact that it’s based on real characters, people either in my life now or in my life in the past. And to Melissa’s point, yeah, I’m not getting as much action as she is on the set. The other thing is I asked my husband about a love triangle. He just won’t go for it. Kind of an old school guy. So I don’t have the love triangle, but other than those two things, it’s pretty authentic, pretty true to life. Kathy, are there some surgeons who use their badass personalities to make them very strong surgeons and some who are just very quiet and introverted, and that makes them good surgeons because they can focus so hard? Dr. Kathy Magliato: It’s a great question, and I think Melissa plays that so well on set. She’s constantly balancing that fierceness with her compassion. So you’re not going to see a show in which you’ve got this, to use Dave’s word, badass surgeon. You’re going to see a very, very complex, interesting character. The show is, again, very, very character driven. So everything is about the character. Even the medical. The medical is fascinating and interesting, but it speaks to the character. So you’re going to see her in those roles, and I do think that there’s a time to be fierce as a surgeon and a time to be tough, and I think there’s also a time to be compassionate. I think sometimes in medicine we miss that. They don’t teach us that in medical school. I will share with you personally that it’s taken me a lifetime, a lifetime, to learn that balance. She learned it in a day. Just saying. Just saying. In what ways does the fierceness make you a better surgeon. How does that do it? Dr. Kathy Magliato: I think being an aggressive surgeon is important when the chips are down. Dave’s character is actually based on my husband in real life, Nick Nissen, who is a liver transplant and hepatobiliary surgeon at Cedars. He and Dave take on cases that no one else will touch in the United States. Pancreatic cancer, the most lethal cancer on the planet, if you want to take on a case like that, there has to be a ferocity. The patient comes first. Saving lives comes first. When you’re dealing with cancer, like Dave’s character will be doing, all they want is time. All they want is for you to buy them time. This beautiful script that Mark Perry wrote with Jill Gordon actually addresses that in one of our episodes. Melissa George: I will leak a little bit. We have a phenomenal, phenomenal episode that we shot about conjoined twins. And one of the twins they’d been joined for 35 years. One of them has cancer. Now, that’s an ethical question that my character is challenged with every day. She has to separate them in order to treat one of the twins. The other one if she does chemo on one, it’s going to affect the heart of the other. The dilemma that my character faces that’s mixed with funny moments — she wants to give the twins a group hug because she has no choice, things like that. It’s the balance of what this show, I think, has that’s special is the emotional tune with the humorous moments. This conjoined twin episode it’s gut wrenching, and is wonderful. There’s a lot of crisis and conflict in this first hour, is that tone something you want to sustain through every episode? Jill Gordon: It varies. I think what was great for me is after I met Kathy and then once Melissa came on board, we realized that we could do a balance of comedy, drama and heart. It just really varies from week to week, depending on the storylines. We have an extraordinary storyline about because of our exposure with areas of medicine that I never knew existed — a heart transplant from a human being into a chimpanzee who was dying and rescued from a lab where she’d been experimented on for 30 years. So we get an opportunity to explore unique areas of medicine, and we do it from a point of view that I think is both dramatic and comedic and full of heart. Don Hany: She said chimpanzee if anyone didn’t hear that. We had a chimp on the show. Don Hany: Nobody reacted to that. You’re going to put a heart from a chimp into a come on. Melissa George: No, from a human into a chimp. Amy Brenneman: I think also, just speaking, there is an unpredictability to how the situations unfold. So the situation that you think is going to be only heart wrenching is actually weirdly funny. Or somebody cracks a joke that is genuinely funny. Similarly, the moments that you think are “cue the strings for the big pathos” is something else as well. So I think who these characters are, who these actors are, there’s an idiosyncratic quality to them that Jill knows how to support. So I think that’s what makes it really watchable and surprising and not predictable. 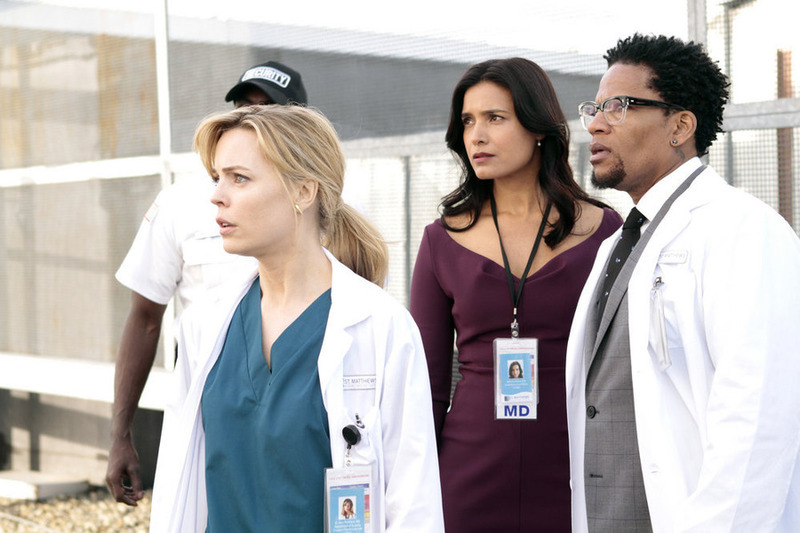 Dr. Kathy Magliato: Add to what Amy just said, the show’s not called “Flatline.” It’s called “Heartbeat,” and it’s because it has a pulse and it has a rhythm. That pulse and rhythm are what’s sitting in front of you right now. There’s an ebb and flow to that. So yes, there’s going to be some times where there’s high energy, but, yes, there’s going to be incredibly beautiful and moving and slow movements within the piece itself. Melissa George: To smile through tears is so difficult to do. I’ve showed the show to my mother. She’s sobbing, and then she’s laughing through it. It was wonderful to see her reaction. We all want to feel something, but at the end of the day, we all want to laugh as well so. Which stories from Dr. Kathy moved you? Jill Gordon: The ones that she wouldn’t let us publicize on television. Brad Silberling: Well, I mean, going right to the pilot, as Kathy said, the airplane story. Why I was moved by that, why we were moved by that driving away from meeting Kathy was it brought together the idea of this woman as a professional, as, in this case, in the real story, a mother trying to just come back home with her family from a vacation, being kicked to the forefront of an emergency situation, doing so with incredible humor, but toughness. I was moved by the fact that, “Wow, your life is about being on call, but you’re so specialized that you’re always going to get kicked to the front of the plane if there’s an incredible emergency, and still balance out being,” in this case in the show, “a great partner to somebody in a new relationship, an ex wife to somebody.” So that comes right to mind, thinking about the pilot. Amy Brenneman: In Kathy’s book and also in speaking with her that day, she has a phrase in her book that I don’t know if we ever invoke, actually, but the “full metal jacket” idea. So it’s when, you know, you have she’s one of 200 woman who have ever done this, right? What’s so beautiful about how Jill writes and how Kathy expresses it and how Melissa embodies it, it’s not a soapbox, and it’s not political, but the reality is that to do that job, you have to know when to put on your full metal jacket, when to take it off. What Kathy’s talking about is, as she expresses it, the further and the more confident she is in her field, the more she takes off her full metal jacket, and she doesn’t have to prove anything. I think that’s one relationship we got interested in really early on is with Jessie, is who mentored that. In my experience, my mother became a judge because there was some dude who said OK. She was the third woman judge in the state of Connecticut because of a man, right? Because he was the gatekeeper. So whether it’s a man gatekeeper or whoever it is, who lets her in? What is that relationship? At what point do you just say, “OK, now I’m on my own”? That’s kind of what built into the flashback idea, was how do you get there, and what was the cost? So I think Jill beautifully knows how to circle back, and these guys just sort of now effortlessly flow into the past when needed. There’s no construct. It’s not but I think that “How did this woman come to be?” became kind of our central North Star early on. Don Hany: That’s what’s great about those flashbacks. This woman is so rare. There’s like four of them, or whatever, in America. But she’s probably the only one I don’t know. I haven’t met the others who came out the other side of the 17 years, 20 years, of just having all that humanity bludgeoned out of you, and she comes out of it with a compassion. That’s something that makes this woman so interesting is that she’s somebody who is kind of and Kathy brings this phrase up in the book. She calls it hand-knob doctors doorknob doctors. Whoops. Dr. Kathy Magliato: That’s the R rated version of the show. 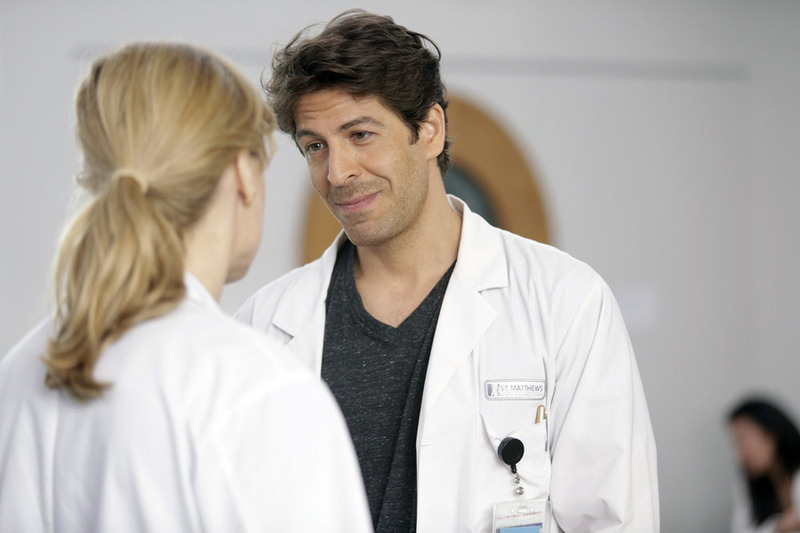 Don Hany: What’s a doorknob doctor? Dave Annable: I mean, I wish. Trust me. Dr. Kathy Magliato: My husband is just as cute and charming as Dave. But then you meet this wonderful man who is not trying to mold me all the time, who is my support, who is equal to me and helps me to push those boundaries, and I love the fact that we’re going to watch all that play out in this show. I think it’s an incredible balance, and I think it mixes it up quite a bit to have the three of you in this incredible triangle. I’m so jealous. Melissa George: If I could have them both, I would. Dave Annable: I’ve had Don. He’s okay. Amy Brenneman: The chimp. What you really want is the chimp. Don Hany: I want the chimp. Melissa doesn’t know this, but I think Jessie’s actually kind of the instrument of your punishment. This is a dream job. I get to turn up and work with this hot Aussie actress, and I mimic her all day, right? Melissa George: The problem is I’m an American in this show, and I have to listen to this accent all day. It’s the only thing I can do. If I’m sounding not like him, then I’m doing a good job. Don Hany: It was a cultural diversity thing, right? They needed an Aussie on the show. Melissa George: Sometimes we go like this, you know. That was a good one, mate. You’re good on that one. Melissa George: I have a pair. It’s in my doughnut cushion. Okay. Too much. Don Hany: We had a harassment meeting. Kathy, what got you interested in being a doctor in the first place and what got you interested in this very specific difficult specialty that you ended up in? Dr. Kathy Magliato: My mom and dad aren’t physicians. In fact, I’m the first and only physician in my family, and I grew up on a farm in Upstate New York in apple country, in the Hudson Valley. So the inspiration to be a doctor came from me, and as cliché as this might sound, I honestly wanted to be a doctor so I could help people. I wanted to dedicate my life to helping others. It is an honor and a privilege to be a physician, to be able to help another human being, a stranger, every day and save lives is an incredible calling, and it wasn’t until I actually held a human heart in sort of a story that’s actually in my book, but the first time I did a cardiac case where I got to put my what did you call them freakishly large hands? My freakishly large hands around a heart to help another surgeon who had a patient who was bleeding out, and I’m holding the human heart, it’s like walking on the moon. How many people get to do this? I’m incredibly inspired, and I said to this surgeon, who actually was Don at the time, I said, “Wait. Do you get to do this every day? And he said, “Do I get to do what every day?” I said, “Do you get to, I don’t know, hold a human heart every day?” And he said, “Well, of course I do. I’m a heart surgeon.” He just went back to saving the guy’s life, and I was like, “I’m done. I’m in. I want to do it.” So that was honestly why I became a heart surgeon. I’ll tell you, if I had a dime, a dime for every time someone told me I couldn’t be a heart surgeon, because I couldn’t be tough enough, I was a woman, if I had a dime for every time someone told me I couldn’t do it, I would be a very rich girl and never have to be a heart surgeon. How many years was it from the time you started college to the time you finished your residency or whatever that made you officially a thoracic surgeon? Dr. Kathy Magliato: It’s about 17 years, so it’s four years of college, four years of medical school, nine years of surgical training. I did three years of research, and then eventually specialized in heart and lung transplantation and artificial heart technology. So I’m actually subspecialized within cardiac surgery to specifically do transplants. Brad Silberling: Her loans will be paid off next year. Melissa George: I was able to see an open-heart surgery in Paris, and usually you are up in the observation deck, but this doctor said, “Scrub in. You’re going to assist me.” I stood on my feet next to the surgeon for almost eight hours not moving, and the patient was prepped, and he pulled out that saw. I looked at him and said, “You’re not going to cut him open?” He said, “How else am I going to get to the heart.” It was spectacular because I only had seen it in movies, and he kept cutting and cutting, and I just kept asking, “When am I going to see the heart? When am I going to see the heart?” And he said, “Almost. We’re almost there.” When he opened him up and I saw that heart beating, I mean, it makes me want to cry. His heart just beating, and he was repairing what was wrong with this 72 year old man, and I was preparing for this role, and I just thought, “I’m the luckiest girl to play this role, just to have witnessed what it is to see the human heart,” and then I waited, and we closed him up, and I then had to rush home and shower because I was covered in bone dust. Then I had to go to the Christian Dior Fashion Show, and that’s true. When I was at Christian Dior Fashion Show, I sat there and I looked at everyone in the front row, and I looked at everyone. I could see their hearts beating through their shirts, and hours before I had a heart in my hand with this doctor. I just went, “I know what every single one of you” even you guys sitting here, I know what every single one of you looks like inside. And if teenagers could watch an open-heart surgery and to see the beauty of a heart and to know that if you look after that heart by eating well and exercising and every teenager, every person should see that so that you know that this is the most beautiful part of your anatomy. She gets to do it every day. I get to do it every day. It’s pretty amazing. Amy Brenneman: You’re not really a doctor. Melissa George: There was an accident at the airport. I was just telling this earlier. Something happened there was an accident. This woman fell from the top of the escalator down to the ground, and I rushed in like I could help her until I was reminded in my head that I wasn’t a doctor. I asked her if she would like a glass of water. For Joshua and Dave, were you able to bring anything to this from your previous roles? Dave Annable: No. I actually think I’m very fortunate that I did my homework, per se, in playing a doctor in the last series I did, because I was able to bring the knowledge I had, any appreciation I had, and I was very, very fortunate, kind of like Melissa, to actually shadow her husband and go to Cedars and stand in on an actual liver transplant, and I was fortunate to go on rounds with him during the day, and I met this patient. It’s crazy how you guys do this every day, but this is something I’ll never forget. She’s a 32 year old girl suffering from nonalcoholic cirrhosis of the liver. Dr. Kathy Magliato: Very nice. Very well done. Dave Annable: Very nervous because there’s a doctor next to me. She was all yellow, and she was holding her husband’s hand, and she was crying, and she had weeks to live. And I’m standing in this room, and just it was so heavy because it was so real, the stakes, and I left the hospital, and I got a call about two hours later from her husband that said, “We found a liver. Do you want to come back and watch the surgery?” It was unlike anything I’ve ever seen in my life, and for eight hours I stood and watched her husband be Superman and save this girl. Two weeks later he sent me a text said he’s releasing her from the hospital. It was just unlike anything I’ve ever seen. I feel really lucky that I’ve been sort of immersed in this world for whatever it is. As an actor, I think it’s great that you get to peek into all these different lives and professions and get to do that, and appreciation and just he’s a smart, brilliant man, and just saving a life was really something I’ll never forget. Dr. Kathy Magliato: And he does a better portacaval shunt than my husband does. Dave Annable: Yeah. What she said. It’s great having her on set because we’re in the OR scenes. She’s like, “David, it looks like you’re playing a piano.” You’re learning how to suture, same thing. I feel like a doctor half the time. I’m like, “Can I help you?” No. It’s a rash.